Bendaroos Magic Wax Super String are tons of fun, hours of pleasure and kids never get bored because there always more new and fun things to do with Bendaroos! 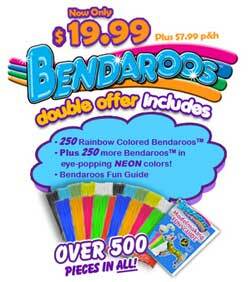 Super durable and easy to use Bendaroos can do just about anything. Create your favorite animal, boat or bridge. Transform ordinary items in cool things a space ships or treasure chest. It´s endless what your kid can do with Bendaroos. Decorate a vase, a frame or make a picture on the window them just remove it! No glue, no stains, no mess! Kids love Bendaroos and so will you.